Oliver Schmidt, 48, is charged with eleven felony counts related to VW's diesel-emissions scandal. 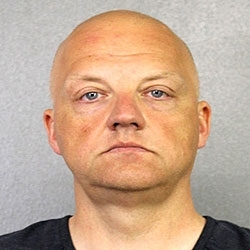 MIAMI/NEW YORK -- A U.S. judge ordered a Volkswagen Group executive charged in the Justice Department's diesel-emissions investigation should be held without bail pending trial. Oliver Schmidt was arrested Saturday at Miami's International Airport as he planned to fly home after a vacation. He was one of six current and former VW executives charged this week in U.S. District Court in Detroit. The other five are in Germany and are unlikely to be extradited. U.S. Magistrate Judge William Turnoff ruled Schmidt was a flight risk. His lawyers said they planned to appeal the decision. The Justice Department also said Schmidt "faces what would be an effective life sentence" if convicted. Schmidt is charged with eleven felony counts, which could be punished by up to 169 years in prison, the government said. Volkswagen agreed to plead guilty and pay $4.3 billion in civil and criminal fines.